Obama is a fear monger. He wants seniors to be afraid of the future, employers afraid to hire workers, and voters afraid of Gov. Romney. No one truly believes that Gov. Romney wants Medicare to collapse. Obama is only trying to put fear into your life, then maybe you will vote for him. Obama is a task master, whip in hand, not a leader. Gov. Romney offers a welcome change to government. A true leader that is use to taking the advise of professionals, assessing complicated issues and making sound decisions. Jay, you don't know what you are talking about. Health insurance, hospital, drug companies all owned by wall street. 30 years ago I worked in California State Dept of Health under boss Reagan. People lost home, savings because one member of family felt ill hospitalized. State closed all mental hospital threw patients into the communities on their own. This is fundamentally wrong for a world first class nation to treat its own citizen, human capital worse than dog. The nation pays the price, and people pay the price as wall street close in demanding more and more greed. America has the best health care technology but only available to those who can afford it. One day, you will fall short, your family member will fall ill, and your insurance company will throw you out on street. What happen to others will, for certainty, happen to you. You will be ill and die in one day, and pray you don't need stay in hospital for too long. 1. The PPACA does nothing to reform Health Care. 2. You can only lose insurance coverage if you don't pay your premium, or if you committed fraud on your application. 3. Mental Health Care closings was the result of the ACLU forcing Mental Health facilities to let patients out, unless the patient has proven to be a serious threat to the community. ESPECIALLY when the SE-C-RET SERVICE WAS THERE??????? We don't need no Stinking Communism! This was not today. The DOW is 13,000+ not 11, 466.28. This was in 2008. Look at the bottom you can see McCani on the bottom. It worked for Kennedy, Reagan, Clinton and G. W. Bush, why wouldn't it work for Romney? You should hire Chris Matthews, because I do not see enough sucking up to Obama. CNN is awfully biased. Don't see one articale on the opposition. PATHETIC new organization. Get REAL. It is a great place for the liberals to feel special. By the way Lizzie, Obama has done nothing that has made a differnce, except in the negative impact category. Please miss know it all, expand on everything he has done, and don't tell me about 4 million jobs created, because all signs show, unemployment is at its all time highest. Obama is the biggest loser since Jimmy Carter. No wonder I get sick to my stomach when I watch CNN. Just lies from the Obama camp, anything to get elected. 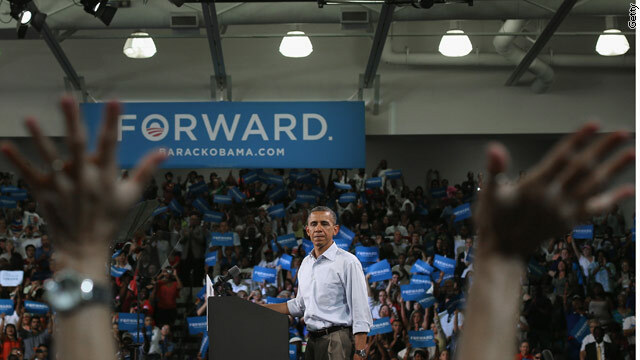 President Obama corrected a serious policy problem by passing the affordable health care act, after Republican and Democratic presidents tried but failed to deliver in the past 100 years. THANK YOU, MR. PRESIDENT. You have our back, we have yours. The law the majority of the citizens STILL don't want? The law with more than 20 new taxes, borne by the Middle Class? The Health Care reform law that doesn't have a single positive health care provision? That Health Care Law? Obama is promising to keep everything, medicare, medicaid, then his tome he never read but wanted passed for fame, power and legacy. The person who wrote it up obviously even got dizzy and blew his sanity, trying to mask his confusion by placing the best part on the front pages. I see it as a cruel hoax on the elderly and gullible. Illegals, mostly Mexican and those hiding under 'Hispanic' for consolidation sake, have the biggest chunk of it, that's why you can only hear their racket at every convention Obama holds. Jay in NC, except you are a romney's support then of course you are blinded by his false promises. budget which will cut and turn the system into voucher program. health in danger. Just wait tomorrow before he changes his mind again. considering voting for Obama because his position is very liberal like the president. You realize that more than 25% of Medicare Recipients are already on the voucher program right? They get better coverage for less money. You forget to mention Seniors prescription costs will increase by 6400 dollars more a year under the Romney plan to pay for the huge tax cuts to the Millionaires and Billionaires. I guess you have no problem passing theses costs on to the Seniors. And how do you figure that? Medicare Part D is already a Private Insurance program. Milton K. Wiah, did Obama flip-flop on gay mirage or did he evolve? As far as Gov. Romney there are issue he supported at a state level but not a federal level. This is consistent with the Republican view point, individual states rights. IN OTHER WORDS, HE WOULD RATHER SIT ON HIS A-S-S THAN DO ANYTHING WORTHWHILE AGAIN, LIKE ROMNEYCARE, BECAUSE HE WANTS THE STATES TO DO HIS JOB FOR HIM. WHY ARE YOU SO EAGER TO ELECT SOMEONE WHO WOULD LOATHES TO WORK IN THE OFFICE HE IS COVETING? They have Republican election rallies in the tax exempt Southern Baptist Churches, I kid you not. Yes many NC voters don't have a mind of their own but are herded into voting Republican by far right preachers who I guess think Jesus was greedy like many of them. McShannon, you have a very bigoted narrow view. Consider this, most black churches are Christian and most herd their members into voting for Obama. The real fact is that Romney doesn't care about Medicare, and that's ok. It's a bogus program anyways. But he knows that in order to win Florida he unfortunately has to at least pretend to care. That's what makes republicans such great leaders, they know the difference between which promises are good to live up to, and how to win elections in the first place. That shows true leadership! I can't wait for R-R to dismantle these horrible socialist programs. This is the "change I believe in". In an interview today Romney appears to have flipped again. Now he say he will not repeal obamacare but keep the good parts . He's from New England. Up here we say if you want to know what the weather will be or what a politician is going to think just wait aminute. That's what we in Massachusetts do when Romeny makes a claim or a statement, we just wait a minute because we know he's going to flip and change his position. Tomorrow you can bet when he's back on the trail it will be" I will Repeal Obamacare lf elected". How can you trust this guy, he's got a position a minute. A regular Minuteman but not like the real Minutemen who carrried a gun and fought for our freedom. Wake up America this guy will say anything to get elected. We have competition in Part D involving plans and co-pays, and the result has been very good. But to suggest that is a voucher system is quite misleading. Also, I believe popular support for obamacare is rising rapidly. Just how does Obama plan on keeping Social Security, Medicare, Medicaid and Obama care? CNNs documentary on Obama never showed his background or religion, nor does he ever disclose his agenda for Mexico, this countries enemies knocking on our front door. With all the Southern countries, Russia, Middle East and China demanding what ever the whim of the moment is, I would like some idea there. Putin, a duplicitous radical, may be a start, but none, not one of these countries or their leaders can be trusted and don't play by convention or rules. I see Rome II in the not far off future, our leaders are intent on ruining us. some of you guys are getting are getting carried away, this is a comments section not the editorial section at the WSJ. Take it easy, secondly any one that says Obama is a socialist or communist or any thing else as idiotic should really get banned. Turn of the right wing radio and step back into Reality, Tax Rates are lowers than they have ever been, we've hired more companies than ever and the Obama Care you guys hate so much is budgeted. I appreciate the effort to bring visual aids to support your point but never the less its dumb. As for the tax cuts worked comment, they didn't for W. You don't start two wars and then give people tax cuts, the same people who rubber stamped every dumb thing G Dubbs wanted on the RNC are crying now about fiscal responsibility. Look I don't carry water for either party, the RNC is forcing me to be a Dem this cycle but I'd like to go back to being independent. As soon as these guys come back to reality and stop stone walling the country to get the presidency back. Its that kind of fifth grade mentality that slows down the development of this country. Surprise! HHS pilot program to send 2 million poor seniors from Medicare into … “voucher” programs. This is a pilot program in Obamacare. Didin't he just criticize Ryan for the same thing? This guy lies every time he speaks. Just remember voters Willard is not a friend of Medicare. Willard will end wellness exams for seniors in 2013. Willard will raise medicare part b to 300 a month in early 2014. Presciption drug coverage will be cancelled on his first day in office. JUST SAY NO TO WILLARD AND THE BOY WONDER 2012. You sure know a lot about what Romney WILL DO, do you also know what Pres.Obama already DID. Re-elect Obama and turn the House in 2012. No more obstruction. The polls for this election should not even be close. Romney/Ryan won't even answer questions or state specifics about how they'll solve the country's problems. Tea Party Republicans have pledged allegiance to Grover Norquist, and not the United States of America. Romney is hiding money offshore and not paying taxes, which is totally un-American. Who the hell is Grover Norquist that anybody should pledge any allegiance to him? Get the heck out of here!. I cannot believe so many ignorant voters don't have the sense to see thru these Republican idiots. Best thing we can do is vote all Tea Party types out of office in November, starting with Allen West, Chaffetz, Sessions, Boehner, Cantor, McConnell, and several other clowns, Re-elect Obama and keep this nation on track. Any other outcome will send this country down a rat hole!!! This is a case where fearmongering is legitimate. Seniors had better be very affraid of was paul ryan wants to do to medicare. The guy has no morals and only answers to the insurance companies that pay his bills. He believes in every man for himself, and he Is looking to cash in bigtime.